Attorneys for Deion Sanders and his estranged wife Pilar Sanders were in a Collin County courtroom Friday morning. The lawyers met with Judge Ray Wheless of the 366th District Court, who decided to move a scheduled emergency protective order hearing to Thursday. Attorney Larry Boyd, who represents Deion Sanders, told NBC 5 he is fine with the judge's decision. Pete Schulte, who represents Pilar Sanders in her criminal case, said Wheless moved the case to combine the hearing with one that had already been scheduled in the Sanders' ongoing divorce proceedings. "Accusations of family violence are serious and can overlap into the family law case," Schulte said. "That's why I'm here today. I'm protecting my client's rights, as she is also accused in this situation." On Monday night, Prosper police were called to the Sanders family home after multiple 911 calls reported an altercation between the couple. Deion Sanders filed for divorce in December. The couple were both still living in the home at the time of the incident Monday. Pilar Sanders was charged with assault family violence, a misdemeanor, and was held in isolation at the Collin County jail overnight because of an emergency protection order filed by police officers. The order her estranged husband is seeking now would supersede the temporary, 60-day order put in place by police, Schulte said. 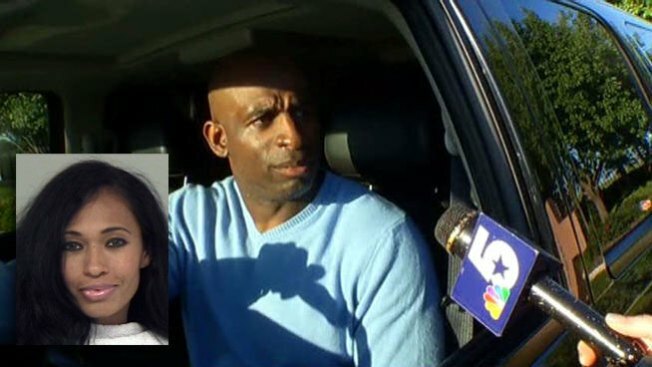 On Tuesday night, Prosper police cited Deion Sanders for his reported role in the altercation. Boyd said his law firm would address questions about possible ethical concerns on another day. Some, including Schulte, have suggested there could be a conflict of interest because Boyd's law firm, Abernathy, Roeder, Boyd & Joplin, does legal work for the city of Prosper. "I really can't comment on that right now," Boyd said. "We're looking into it, and we'll have a comment probably next week."